The Words of Wisdom are from Coach Greg Glassman. In his CrossFit Journal article Virtuosity, CrossFit’s founder explained how mastery of fundamentals should be the focus of all CrossFit programming: “What will inevitably doom a physical training program and dilute a coach’s efficacy is a lack of commitment to fundamentals,” he wrote. The article, published Aug. 1, 2005, is one of the defining documents of the CrossFit method of training. 6:30 Holly Rose’s food addiction actually brought her to the edge of death. At 417 lb., she couldn’t sleep in a bed, wear shoes or pick up her children. She found CrossFit shortly after stomach surgery, and with the help of a good CrossFit coach and lots of hard work, she has lost almost 200 lb. She described her life as a food addict and when she knew she was ready for a change. Rose started exercising in the hospital after surgery, and she could only do 30 seconds at a time. Her progress was painful and slow, but she persevered. As she found CrossFit, she wondered how she would have the gall to walk into a gym in her state of health. 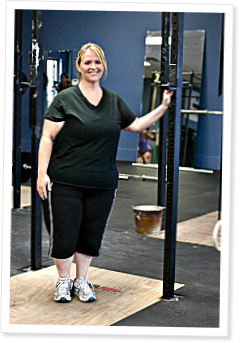 Rose described how the community and culture of CrossFit were instrumental in helping her stick with her training, and now she’s healthier than ever. The fact that she can play with her kids, walk them to school and pick up 40-lb. sacks of dog food is monumental considering what her life was like before. This is the first CrossFit radio episode I have listened to. But I was so intrigued by the story I just had to hear it. Well I'm so glad I did, what an amazing and inspirational story!! Holly is a shining example of what can be achieved, and that it is never too late to change. After hearing that, no excuses will ever be valid for not getting in and giving every WOD 100%. CrossFit has an will continue to change people's lives every day! Don't know if it's just me, but CF Radio episodes 251 and 252 are not appearing in iTunes, and although I downloaded episode 252 to my desktop and transferred it to iTunes manually, I can't seem to access episode 251 at all.